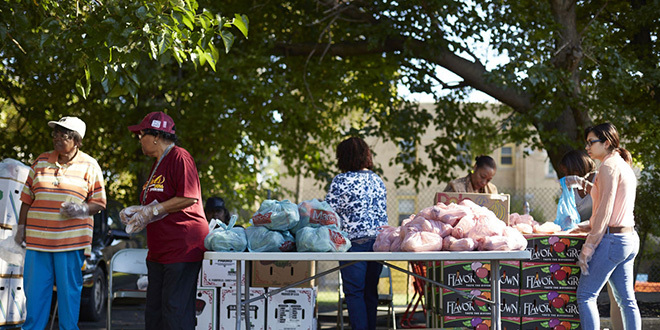 Adults and teens volunteer at a Hunger Network food drop event. Philanthropy comes in many shapes and sizes. It can be volunteering time with an organization or donating money to a cause. It can be giving items to those in need. It’s no secret that adults and established professionals tend to be philanthropic. Ann Garson, managing director of funds and foundations for the Jewish Federation of Cleveland in Beachwood, and Hunger Network of Greater Cleveland Executive Director Jennifer Scolfield and community outreach volunteer coordinator Delpheena Flowers, all said children can certainly benefit from philanthropic activities as well. Garson said the Federation offers many opportunities for children and teens to be involved in philanthropic activities, such as the Saltzman Youth Panel, Super Sunday, high school division of the annual Campaign for Jewish Needs, and many customized experiences across the Jewish community. Scolfield said though the Hunger Network doesn’t typically involve young children in its volunteer opportunities, there are definitely ways for them to become involved alongside their families. Especially in the summertime or during school breaks, they see a large increase in families that bring their children and teens along to volunteer. Scolfield said volunteering at a young age could help children “open their eyes a little bit to other populations.” Children can get insight into the hardships of others when they surround themselves with the different people who volunteer and the people served at the Hunger Network, she said. Flowers said there are also organizational and other benefits for children and teens who volunteer at an early age. Flowers, Garson and Scolfield all said early exposure to philanthropic activities could assist teens and young adults looking to set themselves apart when they apply for college admission. She said many college students tend to go to college not knowing what they want to major in. Volunteering could help them see if civic engagement would be something they are interested in. Volunteer work on a resume can help young adults find a job after a college as well. Scolfield said extended volunteer work shows commitment.